Designed in 1958, the cottage is balanced on the edge of a secluded promontory that plunges down to Mirror Lake in one of Wisconsin's most popular state parks near the Wisconsin Dells. The building possesses a monumentality that is surprising in so small a structure. The exterior and interior walls and huge central fireplace are horizontally-layered local sandstone. Floor and terraces are flagstone. 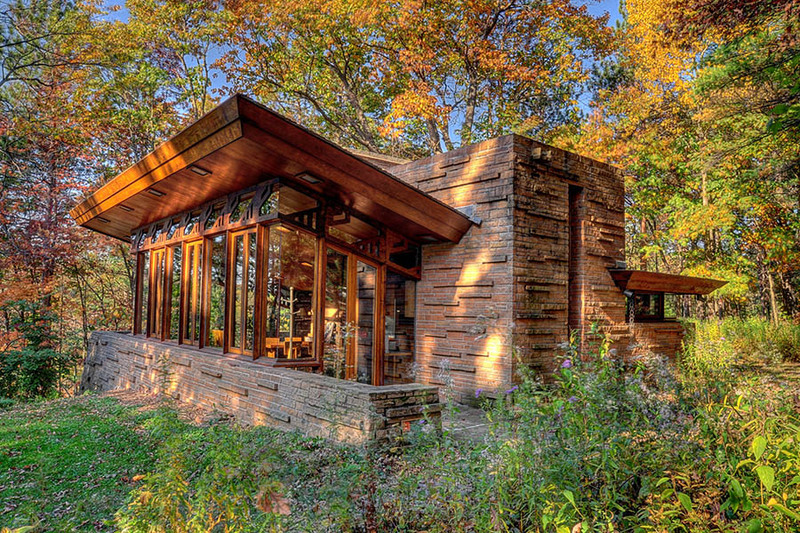 You can actually spend a weekend or a week in a Frank Lloyd Wright cottage. This 900-square foot building is available for vacation rental. The great soaring roof, which seems to hang in space without support, frames the principal views to the west and south, and opens the interior to the surrounding trees, the lake view, and to light and shadow. Available for vacation rentals year-round.